Colorful & Comical Caricatures of Personality Filled Pets. Digitally Drawn Portraits Designed to Look Hand Painted. Is there anything better than Art that makes you smile? Especially when it's full of equal parts skill and personality! 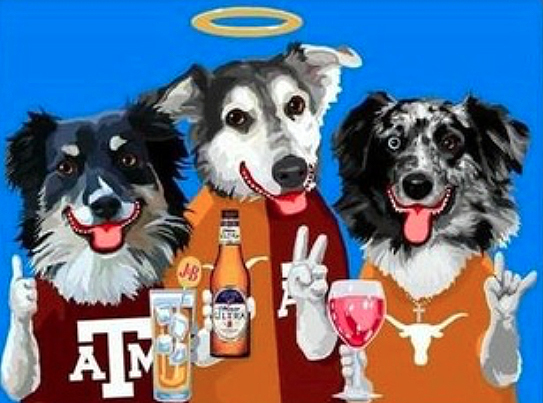 Jimmy Ellis is a digital illustrator with a wonderful knack for playful pet portraits designed to please! I'm naturally drawn to bright colors, so I love how this artist uses a full, vibrant palette with well practiced strokes that come together in beautiful compositions. You'd think he was painting with oils or acrylics on canvas, but no; He's a digital superstar with his computer-synced drawing pad in hand and paint software. I'd be curious to watch his "painting" in progress to see how he achieves such a striking style, taking advantage of all that technology makes possible, but likely with many traditional artistic techniques as well. His characteristic subject matter for these illustrations are dogs, and sometimes cats, with big smiles on their faces and often a beverage in hand. He has an impressive range of dog breeds he can represent, and will also gladly do custom pieces. I'm sure many of you fellow pet owners would admit to imagine your puppies as people from time to time, so it's easy to relate to Jimmy's personified portraits. How great to have talented caricatures anyone would be glad to hang on their wall!